Most people will usually use stain or oiling products to change the colour of their deck, as this will also help to protect the surface. See our guide on the best decking oils & treatment products for more information on this. That being said, paint is still a viable alternative. You may prefer it to staining or oiling if you’re looking to cover an old colour and need a thicker finish. If you have a dark surface, it also allows you to change to a brighter colour as it will cover any surface. This is not something that can be achieved with oil or stain, which retain some of the natural colour of the wood. You should bear in mind that many paints are best avoided for timber as they can often flake and peel under heavy foot traffic, as well as obscuring the grain of the wood. For this reason you need to very careful about the products you use on your surface. The products in our list below were chosen because they are specifically tailored for garden decking – they won’t peel or flake and will leave your surface looking beautifully revitalised. If you’re still unsure, see our guide below on the difference between paint, stain & oil. Or scroll down now for our top products. Can You Paint Over Stain On Decking? What Are The Pros & Cons To Painting Decking? What’s the Difference Between Deck Paint, Stain & Oil? 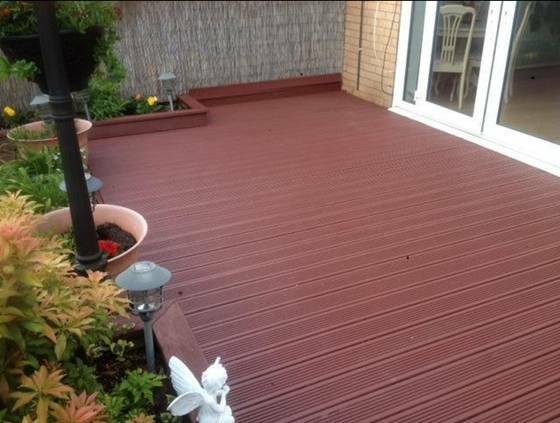 Our best decking paint – won’t peel, looks fantastic and a very reasonable price! Very thick product for a rich, deep colour. Great for old, worn surfaces that need a cover-up. Not specifically tailored for decking but they have an unrivalled range of colours. Firmtread is our favourite option and the best deck paint for those looking to give their old deck a new, polished look. They also have a ‘clear’ option for those looking to ‘spruce up’ their existing colour. The #1 problem deck owners usually experience when painting their surface is that the coating usually begins to peel and flake after 6 months or so. As the name of this product suggests – it is built specifically to resist heavy treading on areas of high footfall. Thankfully, peeling is a problem we’ve never experienced with Firmtread’s Anti Slip range. Painting your surface can also render it slippy underfoot, which is why we’re pleased that all Firmtread products have also built-in anti-slip particles which help prevent the surface becoming slippy in wet weather. These do make your boards feel a little abrasive to the touch, but we feel it’s a price worth paying for safety. For these reasons, this is the best deck paint our experts have used to-date. At [amazon template=price&asin=B00J0CGWTC] per 2.5L tin, it’s also one of the cheapest options on our list. In fact, this product is so good that the only thing we don’t like about it is that the range of colours is too limited, with only four colours available. We’d love a wider pallet of colours to choose from but until then – we’ll have to make do with the four we’ve got! Note that Firmtread isn’t as thick as other paints, so if you’re looking for a thicker coat you should probably check out Ronseal Rescue below. On the plus side this does mean that you can still see the natural grain of the timber boards through the coating. The manufacturers advise that the more times you coat your surface the darker and thicker the colour – so this is always an option to explore for those who really like this product but want a thicker coat. Contains fine particles that help make the surface of your deck resistant to slipping. Won’t peel or flake after heavy use. Slightly cheaper than the other products in our list and fast, free delivery (Amazon UK). Very easy to apply and product comes with a mixing stick. Slightly thinner than other products out there. Range of colours is limited to just four. Coverage: You’ll need at least two coats to achieve an even coverage. Firmtread claim that a 2.5L tin will cover 10m² with two coatings. If you have ridged boards you’ll have a greater surface area to cover and you’ll probably only get 8m² out of a tin. Admittedly we have never had any problems with Ronseal Rescue, but we know that this product has received mixed reviews online. 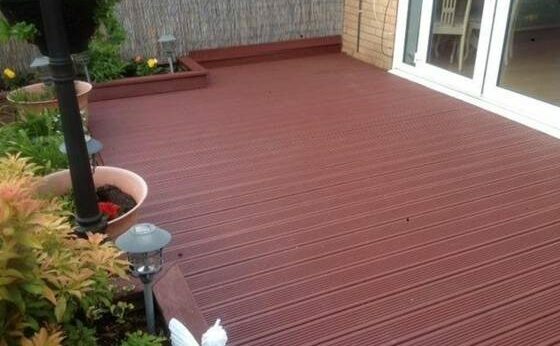 From what we can tell, those customers with decking that receives high footfall and very active dogs have generally had a bad experiences. This is because the paint tends to flake after so many months of hard use, particularly where dog claws or boots can scratch up the surface. While this is not uncommon, many customers have reported it happening more often that it should and it would be remiss of us not to mention it in this review. That being said – many customers have had a very positive experience with this product (us included) and we think it comes down to one thing: if you’re expecting heavy footfall on your structure or you have a particularly active pet dog, use a specialist paint like Firmtread. If you’re expecting average footfall then Ronseal Rescue should work great for you. This is a lot thicker than other alternatives. Because of this, it’s great for covering splits in the wood, awkward joins or unsightly nails. It comes in 8 colours so there’s plenty of choice, especially since these colours are so varied. It also dries quickly with your shiny new surface usually ready to walk on within 24 hours. For those worried about protecting their boards, Ronseal’s Rescue product is water resistant and rainwater should simply bead away. In summary this is a great paint – provided you make sure it’s the right choice for you. It looks fantastic but we’d advise that you don’t take the risk if you have a high traffic deck. Thickest coat on the market – will cover easily any existing surface with deep, thick colour. Great for unsightly screws or splits in the wood. Resistant to moisture and mildew. You get great coverage from one tin (usually 10m/sq minimum). Comes in 8 different colours. Likely to peel if exposed to heavy footfall or dogs with sharp claws. A little more expensive than other products out there. Usually needs refreshing at least once a year. Coverage: Ronseal claim that a 2.5L tub should cover 10m² for ridged boards, or slightly more at 12m² for a flat, planed surface. This includes 2 coatings. We found this to be fairly accurate, so it should be pretty easy to estimate how many tins you’ll need. Best if you’re looking for a very specific colour – they have a huge range! Probably the best known paint for exterior wood and for good reason. You’re probably more accustomed to using it with the garden shed or fencing but Garden Shades works just as well with garden decking. Garden Shades made it into our list for one big reason – they have the greatest range of colours available anywhere. This includes deep reds, blues, greens, purples and yellows for those looking for something a bit different. They also have a huge range of browns and greys for those looking for a more traditional colour. It’s probably not as durable as the other two choices in our list (hence why it’s not our best pick) but if you’re looking for a very specific colour then it can be ideal. You might just need to re-apply it more often than our other choices. The product can be applied with a power sprayer though we recommend you use a hand brush if your surface isn’t too large. This is important to gain even coverage across the entire surface, helping the coating reach every nook and cranny. As always we recommend painting with the grain rather than against it. 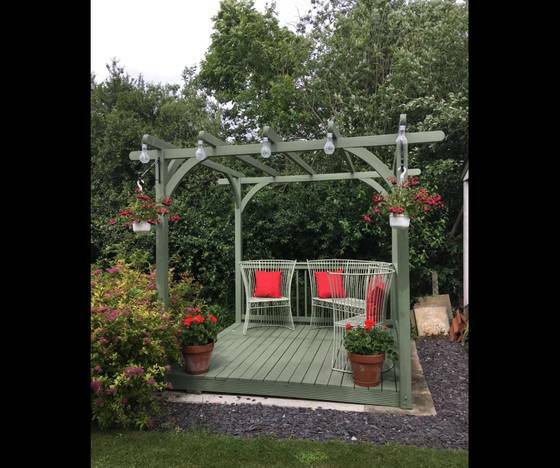 The great thing about Cuprinol Garden Shades is that you can use any leftover product to match with other exterior wood in your garden. 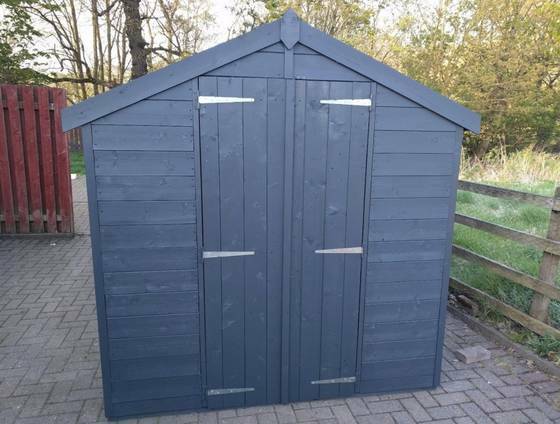 This includes garden furniture, sheds, gates, fencing and more. As a water-based product, it’s also harmless to plants and pets which is a nice added bonus! The down-side is that you’ll never get great coverage with Garden Shades. In fact a 2.5L tin will cover less than half of the other options in our list. This is well worth considering when factoring cost into your choice. Generally we’d only recommend you use Garden Shades if they have a colour you specifically need to use on your deck. Absolutely HUGE range of colours available. Some of the colours look stunning once applied, especially brighter colours like Barleywood and Lemon Slice. 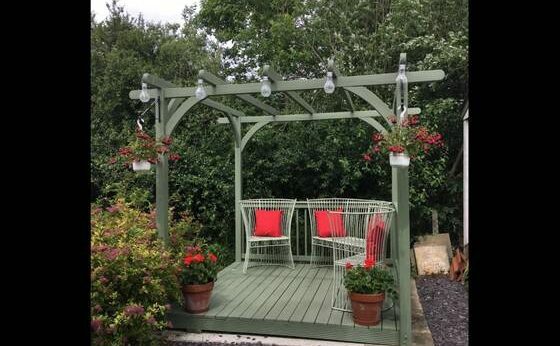 Garden Shades can also be used on other exterior wood objects, which is great if you like some colour coordination in the garden! The coverage isn’t great compared with other options on our list – so it can work out expensive. It’s not specifically tailored for decking, which can cause issues if you have high footfall. Ensure your surface has been sanded and primed before applying. Weaker consistency compared with others in our list and needs a few coats for an even coverage. Coverage: you will need at least two coats (sometimes three) to achieve a consistent and beautiful coverage. 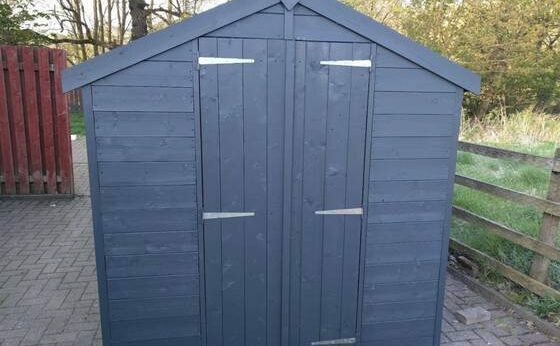 In our experience, a 2.5L tin should cover roughly 5m² with 2 coats of paint. If your surface requires 3 coats then you might only cover 3 or 4m². Yes – paint can look great on a decking surface – provided that you choose the product that’s right for you. You should always use a product that has been certified for use with decking. The material of your boards is very important too. While softwood and hardwood surfaces are usually easy to cover, other materials might not be so easy. Remember that composite boards are usually capped (they have a plastic coating) so you need to be careful about the products you use on the surface. Many products simply won’t ‘stick’. As such it’s highly recommended you speak with the manufacturer of your composite boards should you wish to change their appearance. It’s also true that paint is probably not the right choice for you if you are looking for a natural wood finish for your boards. Painting is usually best where you are looking for dramatic colours that completely change the appearance of your surface. See our guide on our favourite staining & treatment products if you’re looking for a more subtle change. If your boards are brand new they probably won’t need any prep beforehand. ‘Priming’ the surface using a stabilising solution such as Everbuild. When applied these solutions ‘sink’ into the surface, leaving a stable base for subsequent decoration. Generally this would only work with timber decking and not composite or PVC boards. Sanding the surface to reveal a brand new surface on which to apply the paint. This can prove to be quite labour-intensive depending on the tools you have at your disposal. Usually the surface should be sanded twice and cleaned extensively before applying your new coat. If your deck has a glossy or lacquered surface, you’ll likely need to sand this off before you can paint over the surface, as these coatings won’t allow the product to ‘stick’. It is possible, though not always advised. Generally the timber will be more receptive if the surface has been sanded first. If your deck is reaching the end of its life and you’re happy to revitalise it with a lick of paint as one last hurrah before replacing, then it should be fine. Do bear in mind however, that your new coating is highly likely to peel in the near future – and it can be a real pain to remove once it has been applied! There are many varieties of colours, whereas there are only a few types of oil and stain. Paint is much thicker than stain, allowing you to apply light colours over dark colours quite easily. Using a thick product on your surface usually acts as a barrier against moisture – which can be very damaging to your boards. In this way it can help protect your structure and prolong its lifespan. It provides more uniform coverage than oiling or staining. Paint on decking is highly susceptible to peeling. Once you’ve painted your surface, it’s really difficult to remove. Generally the only options you’re left with if it starts to peel are to either go over the surface again, or buy a brand new structure. Typically, it is more expensive per litre than oil and stain. Often you’ll also need to fork out for a primer – which only adds to the expense! What’s the Difference Between Paint, Stain & Oil? This is a very common question for those looks to maintain their structure. Knowing which of these is best to use usually depends on your surface and desired appearance. Paint – thick product used to change the colour of your surface. Light colours can be used over any colour boards. Stain – also used to change the colour of your deck, but retains much of the existing timber style & grain. Oil – will usually darken the existing timber. Oils form a glossy surface that repels moisture and algae. Simply put, you are nearly always better using stain or oils, as they can be easily sanded off in future and replaced. Paint is a more permanent change that is much more difficult to reverse. That being said, if you’re looking for a drastic change in the appearance of your decking, it might still be your best option – especially if you have a dark, weathered surface. Please recognise that while we have made every effort to ensure the accuracy of all information on this site, this cannot always be guaranteed. We would always encourage you to seek thorough advice from a professional before undertaking any work. Decking Hero Ltd is a participant in the Amazon Services LLC Associates Program, an affiliate advertising program designed to provide a means for sites to earn advertising fees by advertising and linking to Amazon.co.uk. Amazon and the Amazon logo are trademarks of Amazon.com, Inc. or its affiliates.